The club, which has been in operation since 1983, was formed to assist thoroughbred breeders through the presentation of talks, seminars, stud visits, social activities and networking opportunities as well as providing incentive awards and a Stallion Tender Scheme. Visits to studs, racing stables and training complexes, annual long weekend bus tour and more. Do you operate a business or service of interest to our members - Advertising is free for members. The ATBC Stallion Tender Scheme was the first of its kind & is still the most affordable. The Clubhouse holds a very good selection of books on Breeding & Thoroughbreds in general. 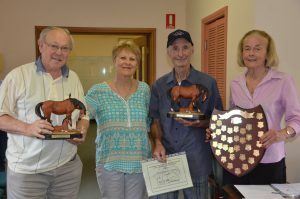 The Club would like to acknowledge the kind donations by stallion owners - without whom we could not continue to operate. "I am still under the impression that there is nothing alive quite so beautiful as a thoroughbred horse"